Increase your manpower and cut the number of hours on site with the help of the Boss x3, a tough new professional manually propelled access platform. Why Choose Lakeside-Hire for Boss X3 Hire ? The ideal alternative to the mobile scaffold tower, hiring the Boss x3 enables contractors to get on with the job without having to spend time assembling and dismantling a scaffold tower while on site. 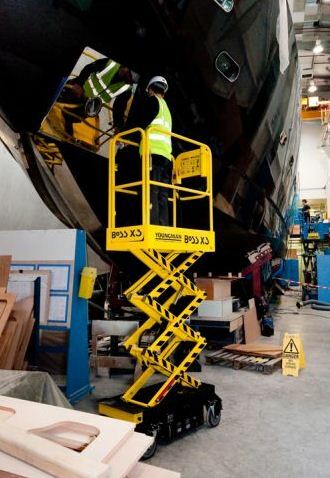 This new scissor lift has been specifically designed to make life easier for those in the hire industry. Safety is paramount and the Boss x3 also includes a number of added security features. The Boss x3 is small enough to fit through standard doorways and even in a lift and it has smooth roll castors with non-marking tyres.